Most of the time companies release a full-size tank and if it does well they will release a smaller version. 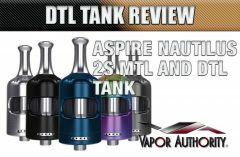 Unfortunately, most follow up tanks are just a shrunken down iteration with less juice capacity. Some go back to the drawing board and redesign a brand new tank to improve on the faults and reflect on customer feedback; then call it a Mini Tank. Luckily for SMOK, the TFV8 is a powerhouse atomizer already that delivers in every way possible! So making a mini out of an already fantastic tank could go perfectly as planned or be a complete disaster. 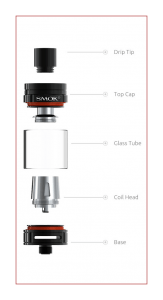 The SMOK TFV8 Baby Beast (Element Vape – $24.95) is pound for pound one of the best 22mm Sub-Ohm Tank’s for its size to date! The SMOK TFV8 Baby Beast fits its name to the highest degree. SMOK did a phenomenal job shrinking down the TFV8 Cloud Beast without sacrificing the bold flavor and cloudy performance we get from its big brother! Putting this Baby Beast side by side with any other tank of its size, it would be tough to pick anything other than the SMOK TFV8 Baby Beast! That’s putting it up against many other great tanks I use in my daily vaping routine but for only a 22mm tank that’s only 45mm tall, it’s a wolf in Sheep’s clothing! 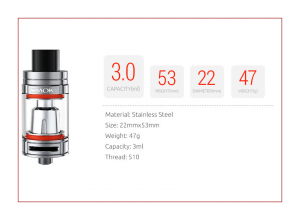 The SMOK TFV8 Baby Beast is a 22mm Sub-Ohm Tank that’s 30% smaller than the larger TFV8 and made from thick, beautifully machined 304 Stainless Steel. Even though I use the SMOK TFV8 as an all-day tank and take it with me everywhere as it is, the Baby Beast makes things a little bit more convenient. It doesn’t drain my battery as fast and takes up less space in my bag. The Black version looks great on any device I attach it to but it’s also available in Stainless Steel. I simply admire the Black version with the Orange O-rings since Halloween is right around the corner! Hopefully SMOK releases a Gunmetal Grey like they did with the TFV8! The TFV8 Baby Beast needs less wattage to achieve a high level of vaping performance. My eJuice lasts longer than the TFV8 Cloud Beast (obviously) but you still get that ‘Taste Furious’ TFV8 vaping experience from the baby. The wattage range the coils can withstand is perfect for the novice crowd and high enough for the more advanced vaper. SMOK TFV4. The amount of airflow available is unreal! Having the TFV4 and the SMOK TFV8 Baby Beast on both my WISMEC RX200S’, taking pulls back and forth you can really appreciate how much more improved and executed the newer tanks are than the older. I still use my SMOK TFV4 often but with so many other great tanks from SMOK being released constantly, it’s hard not to pass it over. The SMOK Baby Beast holds 3ml of eJuice that does get consumed up like a blink of an eye! I can go through a whole tank in a single session at 90W! But that’s to be expected and if you want more juice capacity then buy the bigger tank! The coil life expectancy will vary heavily. I don’t like putting coil life expectancies in my reviews because there are so many variables to take into account. So many devices and everyone has their own way to vape. I use the same eJuice and same milligram of nicotine for every tank review I do to keep things on a level playing field. The Baby Beast has the same swing-open top-fill system as the TFV4 and TFV8. The swinging top cap is stiff and sometimes you have to push down or tweak it a little to get it to close properly. No need for a Vape Band to hold it from opening; when this thing closes it is very secure. But SMOK does include two Vape Bands in the box if you prefer having one on there anyway. The juice fill hole is 7.5mm x 3.5mm, made from the same thick silicone and flexes enough to fit your dropper bottle tip into. The fill hole is slightly wider than the TFV8 Cloud Beast. Some eJuice likes to build up throughout the ridges of the silicone and around the chimney but past SMOK tanks with the swinging door have had the same issue. The two cyclops-style 12.7mm x 1.5mm adjustable airflow slots provide a great amount of airy, open airflow. 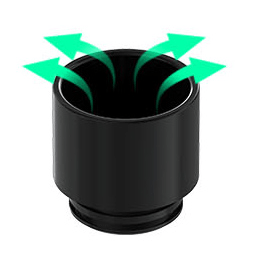 The adjustment ring stops in the open and closed positions versus the TFV8 that spins 360 degrees. The airflow ring is considerably stiffer than the TFV8 making it somewhat difficult to turn when attached to a mod. When the tank is not screwed down it’s very easy to turn either direction. 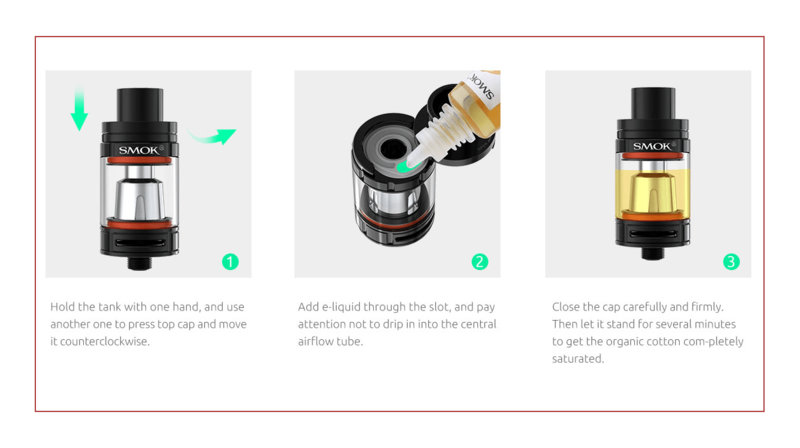 When on a mod, turning it counterclockwise closes the airflow but will spin the tank loose from the device sometimes, but not every time. It’s easy to look past and not something I would worry about. The Delrin chuff-style drip tip is very comfortable and is the perfect height so my lips don’t touch the top cap. Any smaller and I wouldn’t use it at all! Measures 11mm at the top and tapers down. Unlike the TFV8 that isn’t 510-compatible, the SMOK TFV8 Baby Beast is! I do get condensation through the drip tip and under the coil but it’s very minimal. Even with wattage close to triple digits, the drip tip stays fairly warm and never gets too hot. The glass and base stay surprising cooler than I thought they would even when chaining like I normally do! The O-rings are made chunky and should last the life of the tank. But SMOK includes extras just in case. The SMOK TFV8 Baby Beast ‘Hyper-Engine’ coils are built similar to the bigger version but are only about a third of the size. 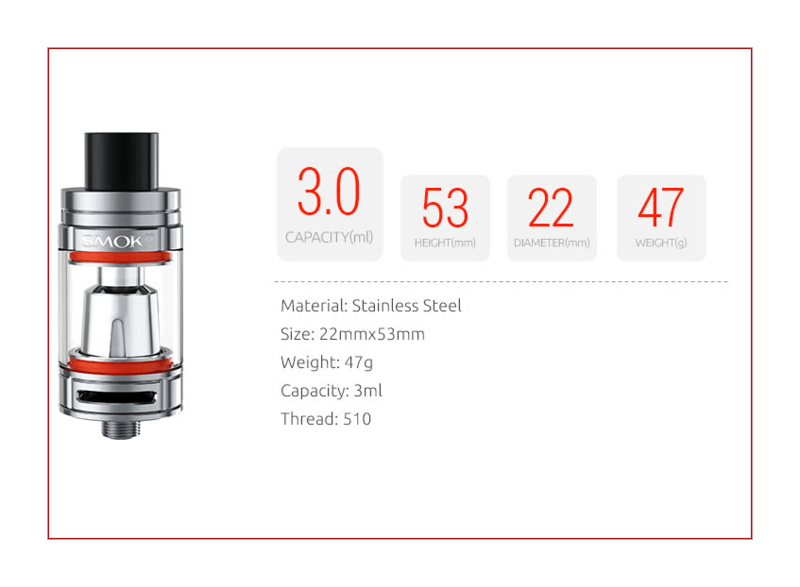 The coils are bigger than the TFV4 Micro in both height and width but smaller than the TFV4. For some reason, my tank did not include the additional V8-Baby-T8 Octuple Core coil! I know it sits there right under the glass when you open the box but mine was factory sealed when I got it and it was nowhere to be found. I’ll order one and report in the comments if I find anything out of the ordinary. 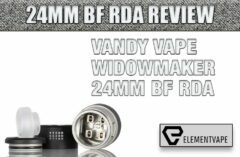 You can see all the specs of your coil clearly right through the glass in case you forget the recommended wattage unlike the TFV4 and the microscopic text! SMOK will be releasing three additional coils; the V8-Baby-T6 Sextuple Core, V8-Baby-X4 Quadruple Core and a V8-Baby-RBA! There has been no leaking at all and zero break-in time with the coil I received. I immediately got the sweetness of my eJuice and the flavor was coming through very rapidly! Even at lower wattages, you still can get a very cloud worthy flavorful vape! My sweet spot is right at 75W resulting in the perfect amount of warmth mixed with the cloud production we all know SMOK can deliver. It’s unfortunate I only received the one coil or I would’ve elaborated more. But I did get close to a week of consistent all-day vaping and over 30ml of juice before the flavor started muting. I could’ve easily got another week but had to put it on the backburner. The only thing I wish SMOK would’ve done is include the RBA like they did with the Cloud Beast! Having to purchase it separately kills me and it’d be nice to have one right now especially with no spare coils in my stash! Thankfully the packaging is a little easier to open! Some of the SMOK products are very difficult to get your finger in between the top and bottom box to pull the lid off. If you’ve had several SMOK products, you’ll know what I’m talking about. Recently, they’ve made the top box smaller than the bottom so it’s easier to remove. Just a small detail SMOK paid attention to and fixed for us knit-picky buyers! The small things mean the most in my opinion. 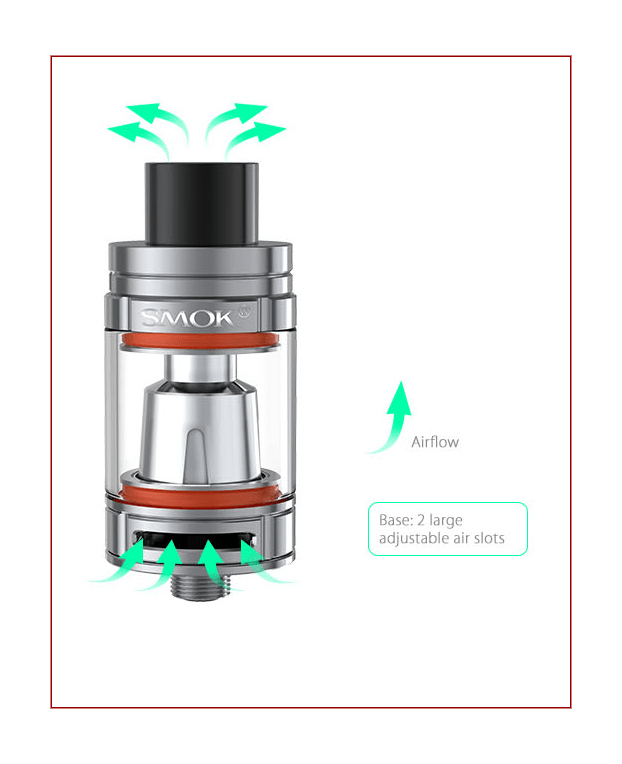 Another concern to throw at you is SMOK has identified fake TFV8 tanks flooding the market. This is obviously nothing new but wanted to make you aware just in case. 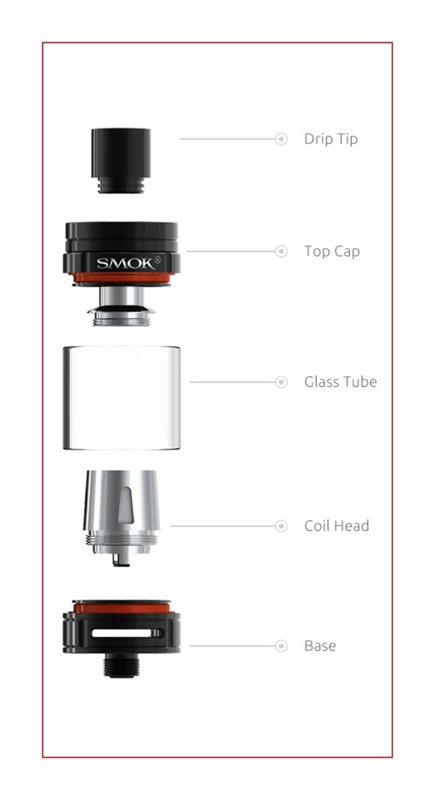 Make sure you visit SMOK’s website to see side by side comparisons of the authentic and faked tank and coils! Just something to keep in mind because I’m sure the TFV8 Baby Beast will be added to the counterfeit list soon enough. SMOK is also playing a huge part in vaping advocacy and it’s a great company to invest your money in. They are putting a lot of money where their mouths are to save our right to vape and we should join them side by side to hopefully win this FDA battle! The SMOK TFV8 Baby Beast is a user friendly, low profile and portable Sub-Ohm Tank that is just spectacular in all facets of vaping! When you think of big performance in a small package, you’re looking at it right here! 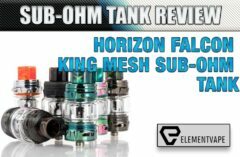 This has to be in my top 3 favorite Sub-Ohm Tanks! I’ve used this tank more and more as the week in review went on and now I can see why! Now all I need to do is get ahold of some new coils and the RBA deck.